Overall body dimensions: 5.75 x 5.75 x 1.15" (L x W x H). Usable area of 132 x 132mm (5.20 x 5.20 inches). 3/8" NPT threaded inlet and outlet. Includes 2 pieces of brass barbed fittings for 1/2" ID Tube. CNC machined from solid Alloy 6061 aluminum billet. NOTE: Some pictures may show the water block as separate pieces. This is only to show the details of the interior. All water blocks come assembled ready to use. Any TECs or TEGs shown are for demonstration purposes only and are not included with the water block. Liquid heat exchanger to rapidly remove heat from the hot side of TECs, TEGs, or just about any component. Most efficient method of removing heat from multiple TECs or TEGs. Very high surface area internal flow path for maximum heat transfer. Annodized clear for corrosion protection. Measures: 5.75 x 5.75 x 1.15 inches. Usable flat area of 5.20 x 5.20 inches (132 x132 mm). Liquid volume (internal) is 205 ml. 18 mounting holes tapped for 6-32 screws. Inlet and Outlet on opposite sides. 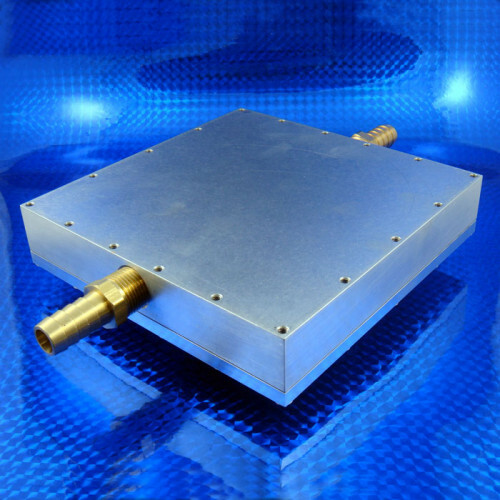 Any object to be cooled up to 132 x 132mm. Single TECs or TEGs up to 132 x 132mm. 2 to 4 TECs or TEGs up to 62 x 62mm. 2 to 4 TECs or TEGs up to 50 x 50mm. 2 to 9 TECs or TEGs up to 40 x 40mm. 2 to 16 TECs or TEGs up to 30 x 30mm. CNC Machined from a solid billet of aluminum with an O-ring seal. Internal flow path is easily serviceable by removing screws and cover. 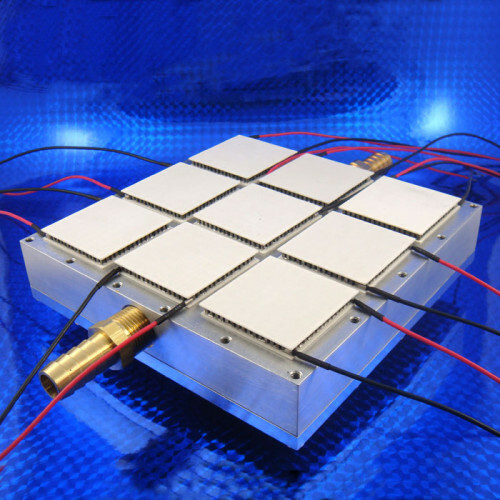 This water block has been tested with a heat load of up to 1600 watts. All indications showed that it could handle higher loads. O-ring material is Buna-N which is capable of fluid temperatures from -29 to +120 C. Alternative o-ring materials are available as an option. Please contact us. NOTE: Many of the 2D and 3D CAD models are "Defeatured". This means the 2D and 3D CAD models provided may withhold details and dimensions of the internal structures in order to protect the proprietary features of the product. By downloading any of the above CAD files, you accept the conditions of our CAD Disclaimer.